In 1985 poet Ross Talarico began a grassroots program in creative expression in Rochester, New York. As the program came together, so did the community--young and old, poor and privileged, even those who could not read or write but wanted to tell their stories. This book is a testimony to the poetry that experience produced. 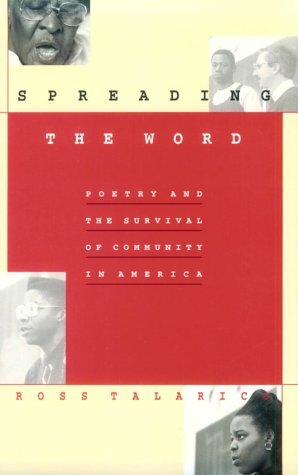 An exhilarating account of a successful experiment in promoting community self-expression, "Spreading the Word" interweaves the participants' stories with Talarico's own life, his struggle as a poet, and the drama of his workshops. The book will be both a resource and an inspiration for teachers of writing, writers, and those who simply wish to learn to write. Drawing on his workshops in Rochester, Talarico describes a unique approach for eliciting poetry from people of many ages and backgrounds--particularly underpriviledged urban kids and the elderly. The process--from dialogue to self-expression to publication to public event--illuminates the urgency and meaning of releasing the spirit captured in each man and woman and child's experience. "Some people say that Ross Talarico has done the impossible," the "Today Show" remarked of his success in Rochester; and with this book Talarico offers the same opportunity to others. Teachers, community leaders, parents, and children will be able to follow his practical, hands-on approach to encouraging self-expression in diverse, even unlikely, settings. They will see here how poetry is indeed relevant, ever more crucial to our identity as the culture evolves--how it is, finally, the place where the inarticulate can come to speak for themselves.